Appearance: In all forms, Saul is on the larger end of the spectrum in regards to height and weight. With a pure wolf heritage, Saul holds the typical body structure that make him immediately recognisable as wolf. In his Optime form, Saul has a mop of scruffy, chestnut brown hair that refuses to be tamed. 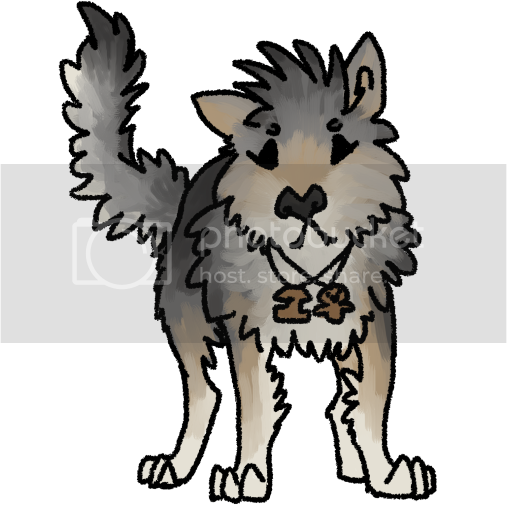 His colouration, unlike his siblings, takes on a more traditional grey wolf appearance. With an undercoat of Satin Linen, Saul has a rough blanket of grey consisting of various degrees of Masala and Shuttle Grey settling over most of the top of his body. The backs of his ears and a streak on the bridge of his nose are a Twine in colour- this colour also brushes the tops of his legs, blending grey into white. His eyes, unlike his siblings, are a bright and voracious Harlequin green, likely taken from his mother. Personality: A truly good character, Saul is always striving to be the best he can. A healer by nature, he has the compassion, intelligence and drive to spend his life trying to help others. Although not truly selfless, Saul puts others before himself as best he can and is always looking out for those he loves. A kind hearted soul, Saul doesn't look for anything in return for his deeds, he does it for the sake of others. Naturally a thinker, Saul spends a lot of time in his own head and is notoriously considered a worrier and in some cases, slightly paranoid. This comes from a deep seated need to protect and care for his family and his pack. As a leader, Saul has a natural, but certainly not over-powerful, dominance and confidence about himself, even if he has bouts of self-doubt every now and then. Unable to do nothing with his day, Saul would much rather be doing something to benefit his pack. He doesn't have much of a temper on him and is described as a bit of a pacifist. That being said, he is not a pushover and will defend himself or his family fiercely if needed.